Tag Archives: Adaptive software development process. This Blog elucidates the pearls of wisdom in Agile Software Development methodology based on best practices, approaches, implementations, frameworks, checklists, cheat sheets, concepts, principles, guidelines, tools, methods, values, practices, philosophies, culture etc. Agile software development is a group of software development methods based on iterative and incremental development, where requirements and solutions evolve through collaboration between self-organizing, cross-functional teams. It promotes adaptive planning, evolutionary development and delivery, a time-boxed iterative approach, and encourages rapid and flexible response to change. It is a conceptual framework that promotes foreseen tight iterations throughout the development cycle. Martin Fowler is widely recognized as one of the key founders of the agile methods. Incremental software development methods have been traced back to 1957.In 1974, a paper by E. A. Edmonds introduced an adaptive software development process. Concurrently and independently the same methods were developed and deployed by the New York Telephone Company’s Systems Development Center under the direction of Dan Gielan. In the early 1970s, Tom Gilb started publishing the concepts of Evolutionary Project Management (EVO), which has evolved into Competitive Engineering. During the mid to late 1970s Gielan lectured extensively throughout the U.S. on this methodology, its practices, and its benefits. So-called lightweight agile software development methods evolved in the mid-1990s as a reaction against the heavyweight waterfall-oriented methods, which were characterized by their critics as being heavily regulated, regimented, micromanaged and overly incremental approaches to development. Proponents of lightweight agile methods contend that they are returning to development practices that were present early in the history of software development. Early implementations of agile methods include Rational Unified Process (1994), Scrum (1995), Crystal Clear, Extreme Programming (1996), Adaptive Software Development, Feature Driven Development (1997), and Dynamic Systems Development Method (DSDM) (1995). These are now collectively referred to as agile methodologies, after the Agile Manifesto was published in 2001. Now, a bigger gathering of organizational anarchists would be hard to find, so what emerged from this meeting was symbolic, a Manifesto for Agile Software Development signed by all participants. The only concern with the term agile came from Martin Fowler (a Brit for those who dont know him) who allowed that most Americans didnt know how to pronounce the word agile. Naming themselves “The Agile Alliance,” this group of independent thinkers about software development, and sometimes competitors to each other, agreed on the Manifesto for Agile Software Development . But while the Manifesto provides some specific ideas, there is a deeper theme that drives many, but not all, to be sure, members of the alliance. At the close of the two-day meeting, Bob Martin joked that he was about to make a “mushy” statement. But while tinged with humor, few disagreed with Bobs sentiments that they all felt privileged to work with a group of people who held a set of compatible values, a set of values based on trust and respect for each other and promoting organizational models based on people, collaboration, and building the types of organizational communities in which they would want to work. Agile Methodologists are really about “mushy” stuff about delivering good products to customers by operating in an environment that does more than talk about “people as our most important asset” but actually “acts” as if people were the most important, and lose the word “asset”. So in the final analysis, the meteoric rise of interest in and sometimes tremendous criticism of Agile Methodologies is about the mushy stuff of values and culture. For example, Jim thinks that ultimately, Extreme Programming has mushroomed in use and interest, not because of pair-programming or refactoring, but because, taken as a whole, the practices define a developer community freed from the baggage of Dilbertesque corporations. Kent Beck told the story of an early job in which he estimated a programming effort of six weeks for two people. After his manager reassigned the other programmer at the beginning of the project, he completed the project in twelve weeks and felt terrible about himself! The boss of course harangued Kent about how slow he was throughout the second six weeks. Kent, somewhat despondent because he was such a “failure” as a programmer, finally realized that his original estimate of 6 weeks was extremely accurate for 2 people and that his “failure” was really the managers failure , indeed, the failure of the standard “fixed” process mindset that so frequently plagues our industry. This type of situation goes on every day marketing, or management, or external customers, internal customers, and, yes, even developers dont want to make hard trade-off decisions, so they impose       irrational demands through the imposition of corporate power       structures. This isnt merely a software development problem, it    runs throughout Dilbertesque organizations. In order to succeed in the new economy, to move aggressively into  the era of e-business, e-commerce, and the web, companies have to  rid themselves of their Dilbert manifestations of make-work and    arcane policies. This freedom from the inanities of corporate life attracts proponents of Agile Methodologies, and scares the         begeebers  out of traditionalists. Quite frankly, the Agile        approaches scare corporate bureaucrats at least those that are     happy pushing  process for process sake versus trying to do the    best for the "customer" and deliver something timely and tangible  and "as   promised" because they run out of places to hide. The Agile movement is not anti-methodology, in fact, many of them  want to restore credibility to the word methodology. They want to  restore a balance. They  embrace modeling, but not in order to file some diagram in a dusty corporate repository. They embrace        documentation, but not hundreds of pages of never-maintained and   rarely-used tomes. They plan, but recognize the limits of planning in a turbulent environment. Those who would brand proponents of XP or SCRUM or any of the other Agile Methodologies as "hackers" are  ignorant of both the methodologies and the original definition of  the term hacker. The meeting at Snowbird was incubated at an earlier get together of Extreme Programming proponents, and a few “outsiders,” organized by Kent Beck at the Rogue River Lodge in Oregon in the spring of 2000. At the Rogue River meeting attendees voiced support for a variety of “Light” methodologies, but nothing formal occurred. During 2000 a number of articles were written that referenced the category of “Light” or “Lightweight” processes. A number of these articles referred to “Light methodologies, such as Extreme Programming, Adaptive Software Development, Crystal, and SCRUM”. In conversations, no one really liked the moniker “Light”, but it seemed to stick for the time being. In 2001, the above authors drafted the agile manifesto. This declaration may be freely copied in any form, but only in its entirety through this notice. Individuals and interactions – in agile development, self-organization and motivation are important, as are interactions like co-location and pair programming. Working software – working software will be more useful and welcome than just presenting documents to clients in meetings. Customer collaboration – requirements cannot be fully collected at the beginning of the software development cycle, therefore continuous customer or stakeholder involvement is very important. Responding to change – agile development is focused on quick responses to change and continuous development. The Agile movement is not anti-methodology, in fact, many of us    want to restore credibility to the word methodology. We want to restore a balance. We embrace modeling, but not in order to file some diagram in a dusty corporate repository. We embrace documentation, but not hundreds of pages of never-maintained and rarely-used      information. We plan, but recognize the limits of planning in a    turbulent environment. Those who would brand proponents of XP or   SCRUM or any of the other Agile Methodologies as "hackers" are     ignorant of both the methodologies and the original definition of  the term hacker. Later, Ken Schwaber with others founded the Scrum Alliance and created the Certified Scrum Master programs and its derivatives. Ken left the Scrum Alliance in the fall of 2009, and founded Scrum.org to further improve the quality and effectiveness of Scrum. In 2005, a group headed by Alistair Cockburn and Jim Highsmith wrote an addendum of project management principles, the Declaration of Interdependence, to guide software project management according to agile development methods. In 2009, a movement spearheaded by Robert C Martin wrote an extension of software development principles, the Software Craftsmanship Manifesto, to guide agile software development according to professional conduct and mastery. Development proceeds in very short iterations, typically 1-2 weeks in duration. Prior to each iteration features are broken down into very small stories. Stories are estimated by developers and then chosen by stakeholders based on their estimated cost and business value. The sum of story estimates planned for the current iteration cannot exceed the sum of estimates completed in the previous iteration. The team consists of developers, business analysts, QA, project managers, etc. The team works together in a lab space or open area where collaboration and communication are maximized. Stories and features are defined by automated tests written by the business analysts, and QA. No story or feature can be said to be done until the suite of acceptance tests that define it are passing. Systems are released to production, or pre-production very frequently. An interval of 2-3 months is the maximum. The minimum can be once per iteration. The whole system is built and tested end-to-end several times each day. While new tests are made to pass, no previously passing tests are allowed to break. Developers must continuously keep the system in a deployable state. Code, and other work artifacts, are not owned by individuals. Any member of the team may work on any artifact at any time. Code, and other work artifacts, look as if they were written by the team. Each team member follows the team standard for format and appearance of the artifacts. Names within code and other work artifacts are chosen to be evocative of the system being created. Building software is a marathon, not a sprint. Team members must run at a rate they can sustain for the long haul. Overtime must be carefully controlled and limited. Tired people do not win. Code and other work artifacts are produced by pairs of individuals working together. One member of the pair is responsible for the task at hand, and the other helps out. Pairs change frequently (every two hours or so) but responsibility stays with the owner. Pair programming, an agile development technique used by XP. The affordability of pair programming is a key issue. If it is much more expensive, managers simply will not permit it. Skeptics assume that incorporating pair programming will double code development expenses and critical manpower needs. Along with code development costs, however, other expenses, such as quality assurance and field support costs must also be considered. IBM reported spending about $250 million repairing and reinstalling fixes to 30,000 customer-reported problems . That is over $8,000 for each defect! In 1999, a controlled experiment run by the second author at the University of Utah investigated the economics of pair programming. Advanced undergraduates in a Software Engineering course participated in the experiment. One third of the class coded class projects as they had for years – by themselves. The rest of the class completed their projects with a collaborative partner. After the initial adjustment period in the first program (the “jelling” assignment), together the pairs only spent about 15% more time on the program than the individuals . Development costs certainly do not double with pair programming! There are many specific agile development methods. Most promote development, teamwork, collaboration, and process adaptability throughout the life-cycle of the project. Developers are not allowed to write production code until they have written a failing unit test. They may not write more of a unit test than is sufficient to fail. They may not write more production code than is sufficient to pass the failing test. The unit tests are maintained and executed as part of the build process. No previously passing unit test is allowed to fail. Code, and other work artifacts, are continuously reviewed and kept as clean as possible. It is not sufficient that code works; it must also be clean. The simplest design that suffices for the task at hand, is the right design. More complex and general designs may become useful later, but not now. We do not wish to carry the weight of that complexity while it is not needed. Sufficient for the day are the complexities therein. Agile methods break tasks into small increments with minimal planning and do not directly involve long-term planning. Iterations are short time frames (timeboxes) that typically last from one to four weeks. Each iteration involves a cross-functional team working in all functions: planning, requirements analysis, design, coding, unit testing, and acceptance testing. At the end of the iteration a working product is demonstrated to stakeholders. This minimizes overall risk and allows the project to adapt to changes quickly. An iteration might not add enough functionality to warrant a market release, but the goal is to have an available release (with minimal bugs) at the end of each iteration. Multiple iterations might be required to release a product or new features. No matter what development disciplines are required, each agile team will contain a customer representative, e.g. Product Owner in Scrum. This person is appointed by stakeholders to act on their behalf and makes a personal commitment to being available for developers to answer mid-iteration questions. At the end of each iteration, stakeholders and the customer representative review progress and re-evaluate priorities with a view to optimizing the return on investment (ROI) and ensuring alignment with customer needs and company goals. In agile software development, an information radiator is a (normally large) physical display located prominently in an office, where passers-by can see it. It presents an up-to-date summary of the status of a software project or other product. The name was coined by Alistair Cockburn, and described in his 2002 book Agile Software Development.A build light indicator may be used to inform a team about the current status of their project. A common characteristic of agile development are daily status meetings or “stand-ups”, e.g. Daily Scrum (Meeting). In a brief session, team members report to each other what they did the previous day, what they intend to do today, and what their roadblocks are. Specific tools and techniques, such as continuous integration, automated unit testing, pair programming, test-driven development, design patterns, domain-driven design, code refactoring and other techniques are often used to improve quality and enhance project agility. Compared to traditional software engineering, agile development is mainly targeted at complex systems and projects with dynamic, undeterministic and non-linear characteristics, where accurate estimates, stable plans and predictions are often hard to get in early stages, and big up-front designs and arrangements will probably cause a lot of waste, i.e. not economically sound. These basic arguments and precious industry experiences learned from years of successes and failures have helped shape Agile’s favor of adaptive, iterative and evolutionary development. Development methods exist on a continuum from adaptive to predictive. Agile methods lie on the adaptive side of this continuum. One key of adaptive development methods is a “Rolling Wave” approach to schedule planning, which identifies milestones but leaves flexibility in the path to reach them, and also allows for the milestones themselves to change. Adaptive methods focus on adapting quickly to changing realities. When the needs of a project change, an adaptive team changes as well. An adaptive team will have difficulty describing exactly what will happen in the future. The further away a date is, the more vague an adaptive method will be about what will happen on that date. An adaptive team cannot report exactly what tasks they will do next week, but only which features they plan for next month. When asked about a release six months from now, an adaptive team might be able to report only the mission statement for the release, or a statement of expected value vs. cost. Predictive methods, in contrast, focus on analysing and planning the future in detail and cater for known risks. In the extremes, a predictive team can report exactly what features and tasks are planned for the entire length of the development process. Predictive methods rely on effective early phase analysis and if this goes very wrong, the project may have difficulty changing direction. Predictive teams will often institute a Change Control Board to ensure that only the most valuable changes are considered. One of the differences between agile and waterfall is that testing of the software is conducted at different stages during the software development lifecycle. In the Waterfall model, there is always a separate testing phase near the completion of an implementation phase. However, in Agile and especially Extreme programming, testing is usually done concurrently with coding, or at least, testing jobs start in early iterations. After almost a decade of mismanagement and waste at the FBI, its CIO turned the agency’s maligned case management implementation into an agile project. Two years later, the system is live. This relative success, as well as the example of other federal agencies, shows that agile can work in Washington. Not only that, the U.S. Government is serious about Agile. Not only is agile part of Federal CIO Steven VanRoekel’s “Future First” initiative, but the Government Accountability Office (GAO) had issued a report on the federal government’s use of agile. GAO identified 32 practices and approaches as effective for applying Agile software development methods to IT projects. The practices generally align with five key software development project management activities: strategic planning, organizational commitment and collaboration, preparation, execution, and evaluation. Officials who have used Agile methods on federal projects generally agreed that these practices are effective. Specifically, each practice was used and found effective by officials from at least one agency, and ten practices were used and found effective by officials from all five agencies. Crystal considers development to be a series of co-operative games, and the provision of documentation is intended to be enough to    help the next win at the next game. The work products for Crystal  include use cases, risk list, iteration plan, core domain models,  and design notes to inform on choices...however there are no       templates for these documents and descriptions are necessarily     vague, but the objective is clear, just enough documentation for   the next game. I always tend to characterize this to my team as:   what would you want to know if you joined the team tomorrow. 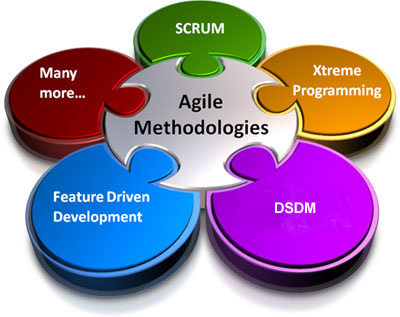 The agile methods are focused on different aspects of the Software development life cycle. Some focus on the practices (e.g. XP, Pragmatic Programming, Agile Modeling), while others focus on managing the software projects (e.g. Scrum). Yet, there are approaches providing full coverage over the development life cycle (e.g. DSDM, IBM RUP), while most of them are suitable from the requirements specification phase on (FDD, for example). Thus, there is a clear difference between the various agile methods in this regard. The Agile Alliance has provided a comprehensive online collection with a map guide to the applying agile practices. This section explains how Primavera Systems, a vendor of project portfolio management solutions, turned around its development organization in 2003. In terms of value to the company, the development organization went from having low no confidence in its ability to deliver and repeated failure to meet expectations, to being cheered for a release that was the hit of their user conference, with good quality and twice the expected functionality. Bonuses were forthcoming for this release. Magic? No, just leadership, hard work, and using a process that turned the leadership and hard work into results. These are the Agile processes Primavera, a 21 year-old software company, sells project portfolio management solutions to help firms manage all their projects, programs, and resources. Primavera was thriving, and its growth was leading to increasingly complex client needs; this put a strain on its ability to release a product that pleased its entire customer base. Throughout 2002, the development organization worked overtime to develop release 3.5. As with other projects in the past, the last three months were particularly bad; the developers sacrificed weekends and home life to get the release out with all of the new requirements. The result – a release seen by management as incomplete and three weeks late, and an exhausted team with low morale. Primavera decided to try the Agile development processes Scrum and XP to fix its problems. 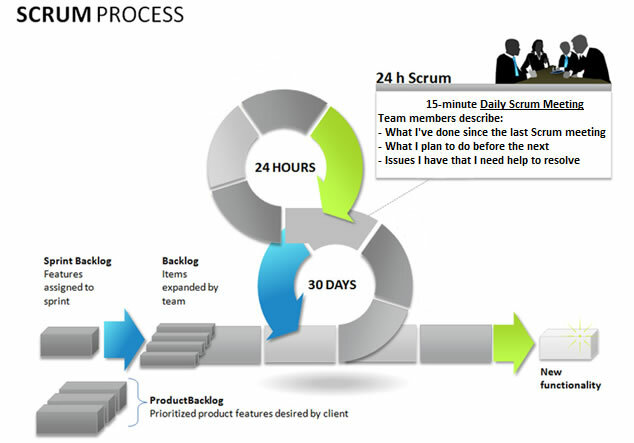 Scrum is an overarching process for planning and managing development projects, while XP prescribes individual team practices that help developers, analysts, testers and managers perform at peak efficiency. Though they are often implemented separately, Scrum and XP are even more effective when implemented together. Primavera adopted Scrum first to improve the way it managed product development, then adopted XP practices to upgrade its product quality and then customized the amalgam to suit its own needs. The result of Primavera’s experiment is a highly satisfied customer base, and a highly motivated, energetic development environment. Of equal value, everyone within Primavera now has a process for working together to build the best releases possible, and is aware of, and participates in, the tradeoff decisions involved. People who haven’t had a chance to work together in years put their shoulders to making each release a success, from CEO, CTO and VP’s to the entire development organization. When the experiment started, Primavera was a very quiet, subdued place to work. It now feels like a vibrant community. A process or capability in which human agents determine a system development approach for a specific project situation through responsive changes in, and dynamic interplays between contexts, intentions, and method fragments. Potentially, almost all agile methods are suitable for method tailoring. Even the DSDM method is being used for this purpose and has been successfully tailored in a CMM context. Situation-appropriateness can be considered as a distinguishing characteristic between agile methods and traditional software development methods, with the latter being relatively much more rigid and prescriptive. The practical implication is that agile methods allow project teams to adapt working practices according to the needs of individual projects. Practices are concrete activities and products that are part of a method framework. At a more extreme level, the philosophy behind the method, consisting of a number of principles, could be adapted (Aydin, 2004). Extreme Programming (XP) makes the need for method adaptation explicit. One of the fundamental ideas of XP is that no one process fits every project, but rather that practices should be tailored to the needs of individual projects. Partial adoption of XP practices, as suggested by Beck, has been reported on several occasions. Mehdi Mirakhorli proposes a tailoring practice that provides a sufficient road-map and guidelines for adapting all the practices. RDP (rule-description-practice) Practice is designed for customizing XP. This practice, first proposed as a long research paper in the APSO workshop at the ICSE 2008 conference, is currently the only proposed and applicable method for customizing XP. Although it is specifically a solution for XP, this practice has the capability of extending to other methodologies. At first glance, this practice seems to be in the category of static method adaptation but experiences with RDP Practice says that it can be treated like dynamic method adaptation. The distinction between static method adaptation and dynamic method adaptation is subtle. Sabre Airline Solutions adopted XP in 2001. With its new model, Sabre does iterative development in small, simple steps. The company uses two-week iterations, and customers see a new release every one to three months. Features, called “stories,” are expressed in user terms and must be simple enough to be coded, tested and integrated in two weeks or less. Automated unit tests (against the programmer’s criteria) and broader acceptance tests (against customer requirements) must be passed at the end of each iteration before the next can begin. Unit and acceptance tests for each feature are written before the feature is coded. If a developer has trouble writing a test, he doesn’t clearly understand the feature. Actual coding is done in pairs by teams in open labs, promoting collective ownership of code, although individuals sometimes do the simplest tasks. Programmers are re-paired frequently, often every day or two. They sign up for the tasks they want to do and the person they want to pair with. Every project team has an “XP coach” and an application subject-matter expert called the XP customer. The XP customer stays in or near the programming lab all or most of the time. He decides on and prioritizes product features, writes the stories for programmers and signs off on the results. “Refactoring” code—rewriting it not to fix bugs or add features but to make it less redundant and more maintainable—is strongly encouraged. Sabre says the concept hardly existed at the company before XP because it was too difficult. Agile methods have much in common with the Rapid Application Development techniques from the 1980/90s as espoused by James Martin and others. In addition to technology-focused methods, customer-and-design-centered methods, such as Visualization-Driven Rapid Prototyping developed by Brian Willison, work to engage customers and end users to facilitate agile software development. In 2008 the Software Engineering Institute (SEI) published the technical report “CMMI or Agile: Why Not Embrace Both” to make clear that the Capability Maturity Model Integration and Agile can co-exist. Modern CMMI-compatible development processes are also iterative. The CMMI Version 1.3 includes tips for implementing Agile and CMMI process improvement together. While agility can be seen as a means to an end, a number of approaches have been proposed to quantify agility. Agility Index Measurements (AIM) score projects against a number of agility factors to achieve a total. The similarly named Agility Measurement Index, scores developments against five dimensions of a software project (duration, risk, novelty, effort, and interaction). Other techniques are based on measurable goals. Another study using fuzzy mathematics has suggested that project velocity can be used as a metric of agility. There are agile self-assessments to determine whether a team is using agile practices (Nokia test, Karlskrona test, 42 points test). While such approaches have been proposed to measure agility, the practical application of such metrics is still debated. There is agile software development ROI data available from the CSIAC ROI Dashboard. One of the early studies reporting gains in quality, productivity, and business satisfaction by using Agile methods was a survey conducted by Shine Technologies from November 2002 to January 2003. A similar survey conducted in 2006 by Scott Ambler, the Practice Leader for Agile Development with IBM Rational’s Methods Group reported similar benefits. Others claim that agile development methods are still too young to require extensive academic proof of their success. Large-scale development efforts (>20 developers), though scaling strategies and evidence of some large projects have been described. Distributed development efforts (non-colocated teams). Strategies have been described in Bridging the Distance and Using an Agile Software Process with Offshore Development. Forcing an agile process on a development team. Mission-critical systems where failure is not an option at any cost (e.g. software for avionics). The early successes, challenges and limitations encountered in the adoption of agile methods in a large organization have been documented. In terms of outsourcing agile development, Michael Hackett, senior vice president of LogiGear Corporation has stated that “the offshore team … should have expertise, experience, good communication skills, inter-cultural understanding, trust and understanding between members and groups and with each other. 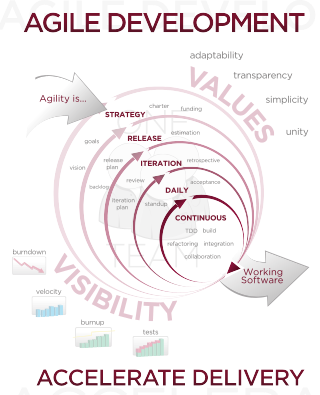 Agile methodologies can be inefficient in large organizations and certain types of projects. Agile methods seem best for developmental and non-sequential projects. Many organizations believe that agile methodologies are too extreme and adopt a hybrid approach that mixes elements of agile and plan-driven approaches. The term “agile” has also been criticized as being a management fad that simply describes existing good practices under new jargon, promotes a “one size fits all” mindset towards development strategies, and wrongly emphasizes method over results. Alistair Cockburn organized a celebration of the 10th anniversary of the Agile Manifesto in Snowbird, Utah on February 12, 2011, gathering some 30+ people who’d been involved at the original meeting and since. A list of about 20 elephants in the room (“undiscussable” agile topics/issues) were collected, including aspects: the alliances, failures and limitations of agile practices and context (possible causes: commercial interests, decontextualization, no obvious way to make progress based on failure, limited objective evidence, cognitive biases and reasoning fallacies), politics and culture. The agile movement is in some ways a bit like a teenager: very     self-conscious, checking constantly its appearance in a mirror,    accepting few criticisms, only interested in being with its peers, rejecting en bloc all wisdom from the past, just because it is fromthe past, adopting fads and new jargon, at times cocky and arrogant. But I have no doubts that it will mature further, become more    open to the outside world, more reflective, and also therefore moreeffective. Agile methods have been extensively used for development of software products and some of them use certain characteristics of software, such as object technologies. However, these techniques can be applied to the development of non-software products, such as computers, motor vehicles, medical devices, food, and clothing; see Flexible product development. Agile development paradigms can be used in other areas of life such as raising children. Its success in child development might be founded on some basic management principles; communication, adaptation and awareness. Bruce Feiler has shown that the basic Agile Development paradigms can be applied to household management and raising children. In his TED Talk, “Agile programming — for your family”, these paradigms brought significant changes to his household environment, such as the kids doing dishes, taking out the trash, and decreasing his children’s emotional outbreaks which inadvertently increased their emotional stability. In some ways, agile development is more than a bunch of software development rules; but it can be something more simple and broad, like a problem solving guide.